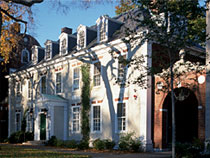 The Institute for Strategy and Competitiveness is located in Ludcke House, a historic building on the Harvard Business School campus. Although Harvard Business School was established in 1908, it was not until June 2, 1925, that construction of today’s campus began. Ludcke originally served as the Faculty Club. The original campus plans, based on classical models, were designed by the nationally prominent architectural firm of McKim, Mead & White. 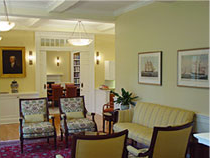 As of the mid-1950s, the entire faculty was still small enough that it could meet and eat together on the second floor of the Faculty Club. Since then, the building has been home to the Doctoral Program, External Relations, the Communications Group, and the Department of Operations. The building has also experienced several name changes. It was once named the Old Doctoral Building and Alumni Center. In 1991, the building was renamed Ludcke in appreciation of a generous gift from Mr. and Mrs. Gipp L. Ludcke. Ludcke (MBA ’25) was a pioneer in the mutual fund industry and an active supporter of the School for many years. The Institute is proud to be housed in this venerable Harvard Business School building.